Understated elegance with house like proportions, this full floor penthouse spans over 470m2 with a perfect north east riverfront position. Recently renovated, the vision was to create a practical layout, featuring high quality finishes and fixtures whilst maximising the expansive views of the Brisbane River Reaches and Story Bridge. The open plan living and dining area absorbs these spectacular views, to give you an unrivalled backdrop whether you are entertaining or relaxing. With over 100m2 of covered outdoor alfresco space, wetbar and bbq, it is perfect to entertain your guests any time of the day. One of the hearts of the home, the gourmet kitchen, with integrated European appliances and premium fixtures, ample cabinetry and beautiful stone benchtop. Flowing seamlessly from this space is the living, dining and outdoor entertaining space. The luxurious master suite is positioned thoughtfully in its own wing, designed to cater to all buyers, embracing river views with balcony access. This suite contains a walk-through robe with over 10m of linear hanging and generously sized ensuite with its own balcony access, fitted with a dual basin vanity, dual shower and bathtub. Down one wing of the Penthouse you have an ensuited Cinema room and separate ensuited bedroom. Located on the other wing, is another oversized ensuited bedroom, a home office or fifth bedroom option and the perfect entertaining room, the games room, with built in fridges and opening onto an alfresco area with views of the Brisbane River and City. 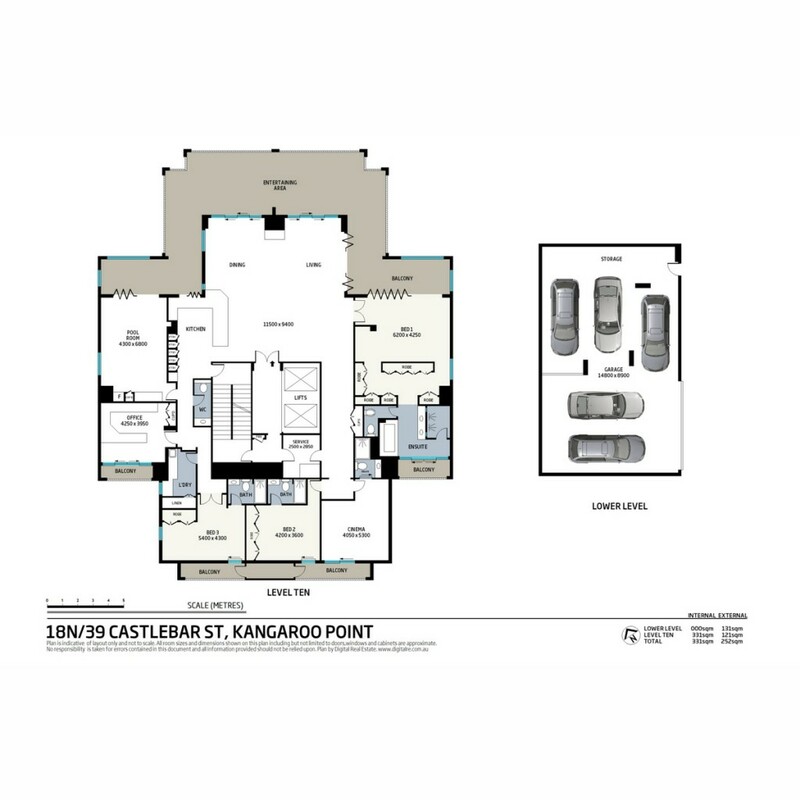 This penthouse is a house alternative, situated across one level with up to 5 bedrooms if required, with a lock up 5 car garage, superior to most high end homes in Brisbane. Castlebar is renowned for its state-of-the-art resort style facilities including a heated swimming pool, gym, spa, two plunge pools plus dry and steam saunas. The barbeque pavilion provides ample dining areas, manicured lawns and landscaped gardens which complement the property's 74m metre river frontage. Experience the pinnacle of exclusivity at Castlebar, just minutes to the CBD and an array of world renowned entertaining and dining destinations across Brisbane. An enviable lifestyle, with Brisbane right at your doorstep, exclusive opportunities like this one will not last. Enquire today to secure this outstanding penthouse.